"Alice was always beautiful--Armenian immigrant beautiful, with thick, curly black hair, olive skin, and big dark eyes," writes Dana Walrath. Alice also has Alzheimer's, and while she can remember all the songs from The Music Man, she can no longer attend to the basics of caring for herself. Alice moves to live with her daughter, Dana, in Vermont, and the story begins. Aliceheimer's is a series of illustrated vignettes, daily glimpses into their world with Alzheimer's. Walrath's time with her mother was marked by humor and clarity: "With a community of help that included pirates, good neighbors, a cast of characters from space-time travel, and my dead father hovering in the branches of the maple trees that surround our Vermont farmhouse, Aliceheimer's let us write our own story daily--a story that, in turn, helps rewrite the dominant medical narrative of aging." In drawing Alice, Walrath literally enrobes her with cut-up pages from Alice's Adventures in Wonderland. She weaves elements from Lewis Carroll's classic throughout her text, using evocative phrases from the novel to introduce the vignettes, such as "Disappearing Alice," "Missing Pieces," "Falling Slowly," "Curiouser and Curiouser," and "A Mad Tea Party." 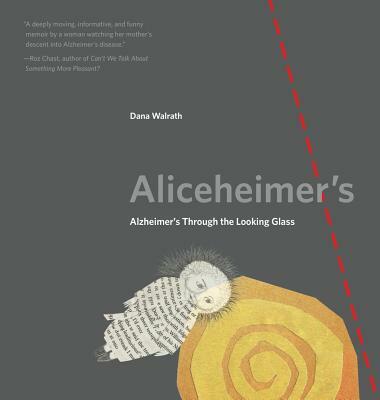 Walrath writes that creating this book allowed her not only to process her grief over her mother's dementia, but also "to remember the magic laughter of that time." Graphic medicine, she writes, "lets us better understand those who are hurting, feel their stories, and redraw and renegotiate those social boundaries. Most of all, it gives us a way to heal and to fly over the world as Alice does." In the end, Aliceheimer's is indeed strangely and utterly uplifting. Dana Walrath--an anthropologist, artist, and writer--is on the faculty of the University of Vermont College of Medicine and the author of Like Water on Stone. Learn more about her work at danawalrath.com.